Anyone who wants to understand the difference between a hip hop dance team and a hip hop dance company should see Philadelphia-based Rennie Harris Puremovement, presented this past weekend by Stanford Lively Arts as part of their 2010-2011 season. Dance teams are great - performance with attention to synchronicity, exciting acrobatic tricks, superb technique and a commitment to perfection. Yet in the face of all this 'amazing-ness', there is an overwhelming sense that something is missing. Enter Rennie Harris Puremovement, which takes hip hop from the somewhat sanitized team experience to an artistically rigorous company experience. Here is a group whose mission is to do more - technically superior hip hop with the undercurrent of relevant issues: the individual versus the collective; diversity of movement; and the importance of representational narratives in a traditionally presentational format. Almost all dance companies struggle with the puzzle of the individual and the collective, agonizing over how to reconcile the importance of both without sacrificing either. Rennie Harris has successfully navigated this issue by realizing and concluding that these two elements (the individual and the collective) need not be contentious nor exclusive. In fact, if both are fostered and encouraged, the result is actually more cohesive and holistic. Harris has worked diligently with his dancers to create synchronized movement alongside a sense of individual 'isms', particularly apparent in the upper body, arms and hands. This allowed Harris' hip hop choreography to transcend the emptiness that we sometimes see with dance teams. This was definitely a cohesive dance group who were expressing the choreography as a whole, yet within that, the individual pieces were clear, giving flavor and uniqueness to the dance. 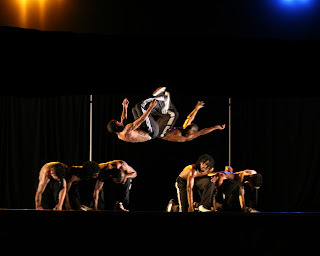 Puremovement also provided a glimpse into several additional dance styles, incorporating them into the hip hop physicality rather than fusing them together. Hip hop remained the predominant force, yet the injection of different genres revealed that all dance is linked together through the common denominator of movement. There were multiple instances of good old-fashioned lyrical jazz dance, with parallel piqué turns and tendus in 2nd position that sensuously dragged across the floor ("Loving Heaven") as well as some rhythm tap sequences: jump, dig, jump, step; and toe beat, heel beat. Though I didn't actually see any traditional ballet, there was one moment in the first Act where a trio of women dancing center stage drew me to a classical comparison. As they moved with true abandon, I imagined that this is what the cygnets in "Swan Lake" are meant to express: allure, desperation and power. The program noted that Harris' company performs a full-length evening work, "Rome & Jewels" that is informed by "Romeo & Juliet" and "West Side Story". Act II's "P-Funk" was without doubt, an ode to Jerome Robbins, the choreographer of "West Side Story". It was both novel and different, but still had some classic Robbinsesque moves: the side kicks with flexed feet, and the mambo base step. Unfortunately, Stanford Memorial Auditorium was not the ideal venue for this particular group. The building itself is architecturally interesting, though several design elements made it difficult to see the dancer's feet, and this visual line is imperative for dance. The slight pitch of the seats combined with the height of the stage masked the intricate footwork, and it was a shame that much of Harris' creative choreography was hidden from view. The Joffrey Ballet - "The Nutcracker"